Mr. Sammy Lahiri is currently a 3rd Degree Decided Black Belt. Having previously earned his black belt at another school, he began studying taekwondo with Mr. Weislogel as a 1st Degree Black Belt in the Fall of 2011. 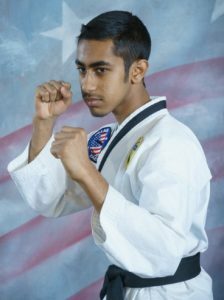 Mr. Lahiri began helping in classes since he started at Village Taekwondo and became a Level 3 Instructor in Taekwondo America in October of 2014. He is currently away at college, but we expect him to return to teaching over the summer.